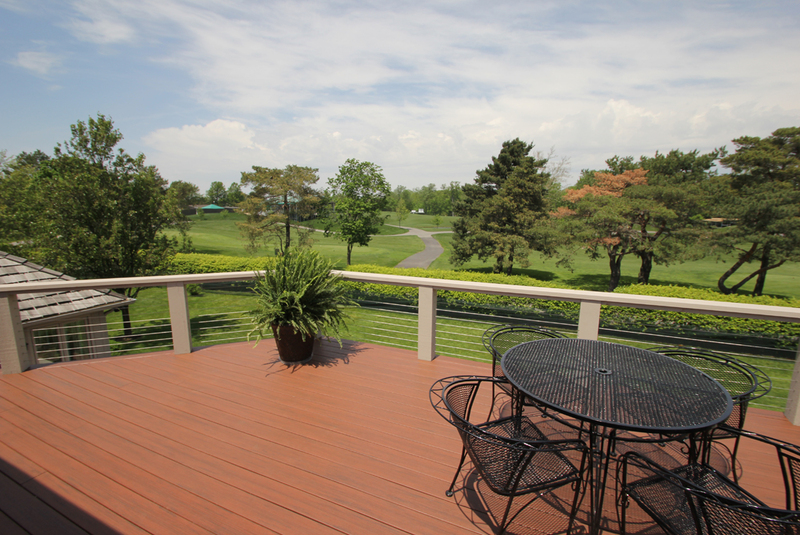 The location of this 1970s-era ranch home – on the tournament course at the Muirfield Village Golf Club – was a hole-in-one, but the dilapidated deck wasn’t up to par (ok, no more bad golf cliches – I’m talking about a two level custom deck). 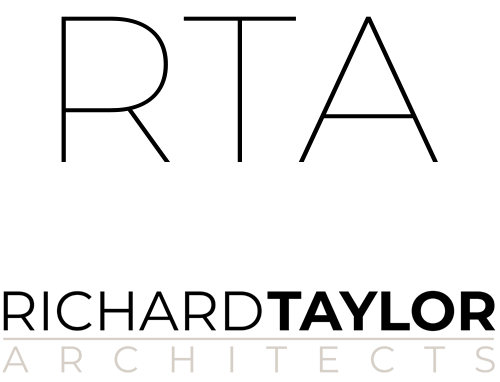 As part of a total makeover the house, the new owners recognized that the home’s view of the course was one of it’s strongest assets – and hired us to completely redesign the outdoor living spaces. 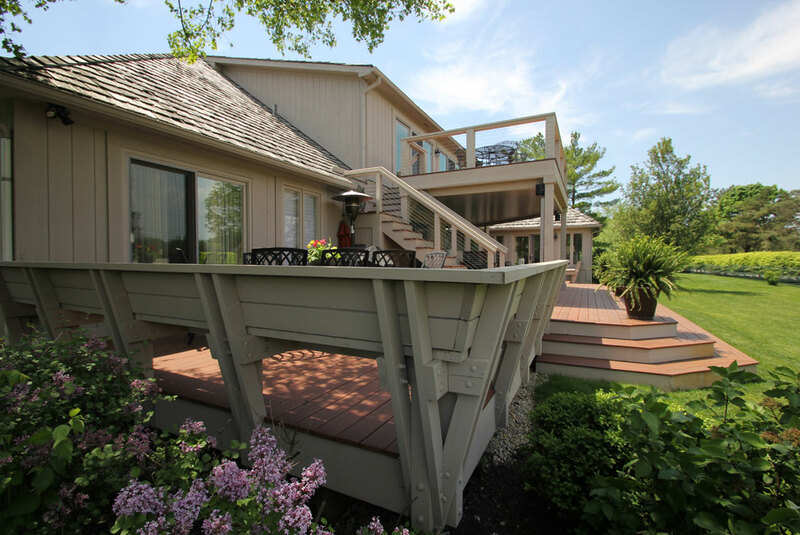 What I designed for them are four separate but connected spaces – the main ground level covered deck, two smaller decks with built-in seating, and a big upper deck with great views of the golf course. 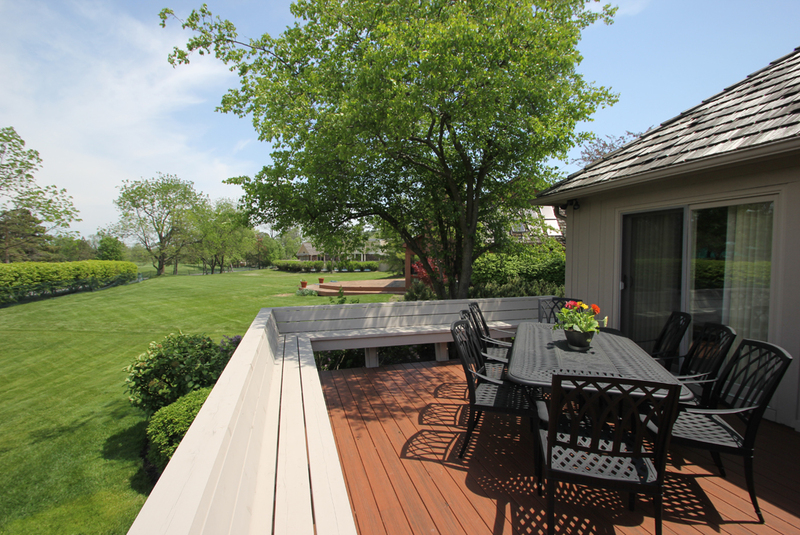 This small part of the deck has the built-in seating, but it’s also large enough for a full-sized dining table. 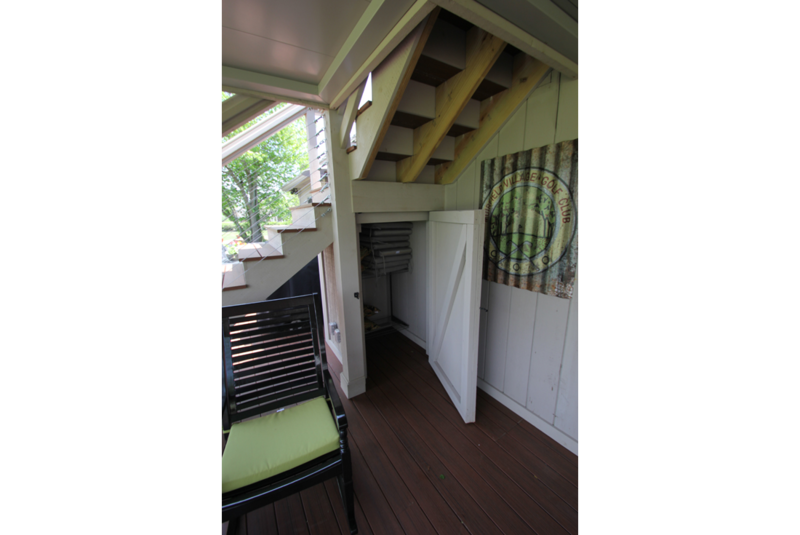 Doors from the kitchen open right out onto the deck. The new stair, and the railing surrounding the upper deck, both use a stainless steel braided cable railing system (“Cable-Rail”) instead of wood balusters. Seated on the upper deck, there’s very little blocking your view of the action on the tournament course, or just your enjoyment of the view. This is a view of the 17th tee from the new upper level. 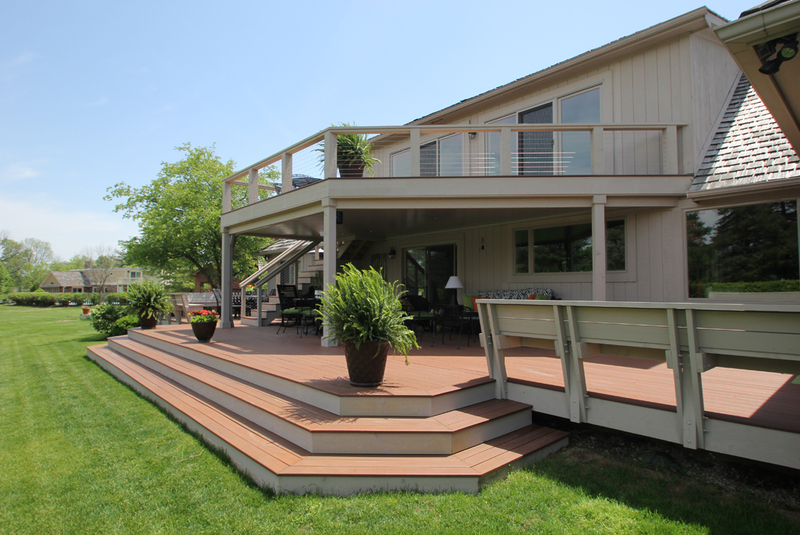 The new deck is topped with composite boards for low maintenance and long life. 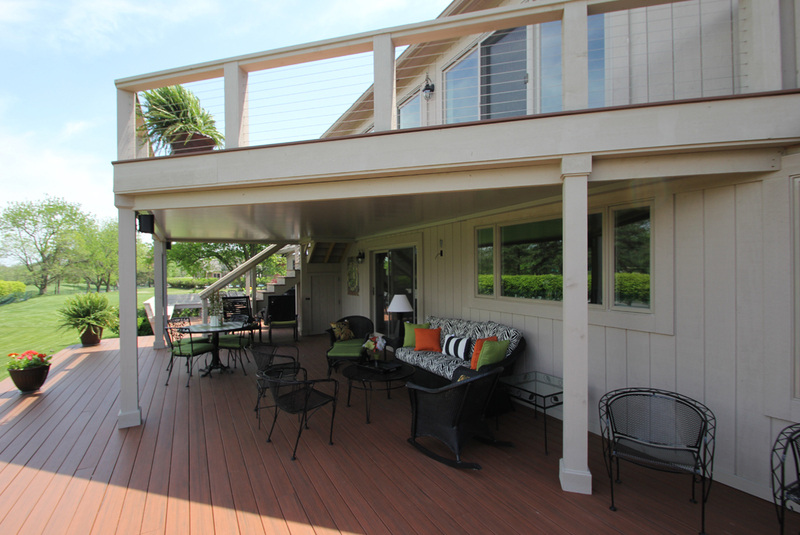 On the underside of the upper deck, a drainage system makes the lower deck usable anytime (no rain dripping from the upper deck) and great-looking, too. The ceiling panels drain to concealed gutters and downspouts. 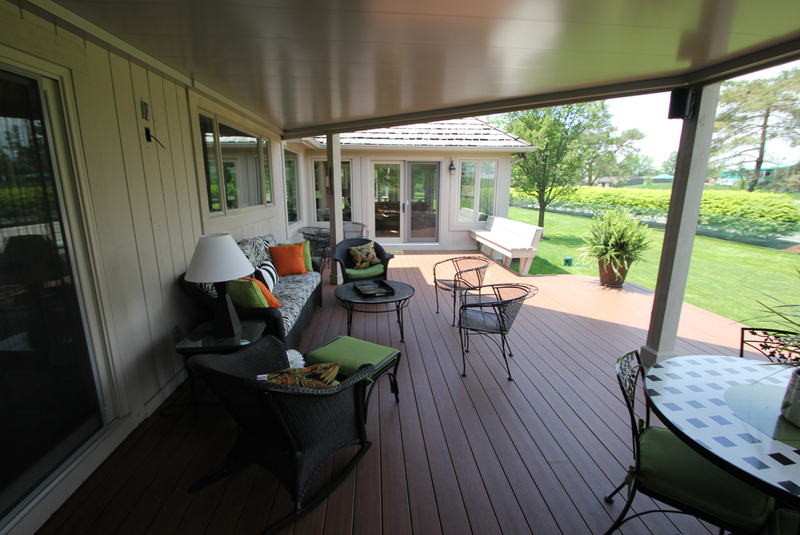 The view back towards the house shows how a full set of patio furniture fits comfortably in the shade – this really is an outdoor room. I hate wasted space, so I took advantage of the area under the new stair as a place to store chair cushions out of the weather. The big broad steps I designed at the yard level are extra-deep, just right for casual seating and easy walking out by the golf course during the tournament. 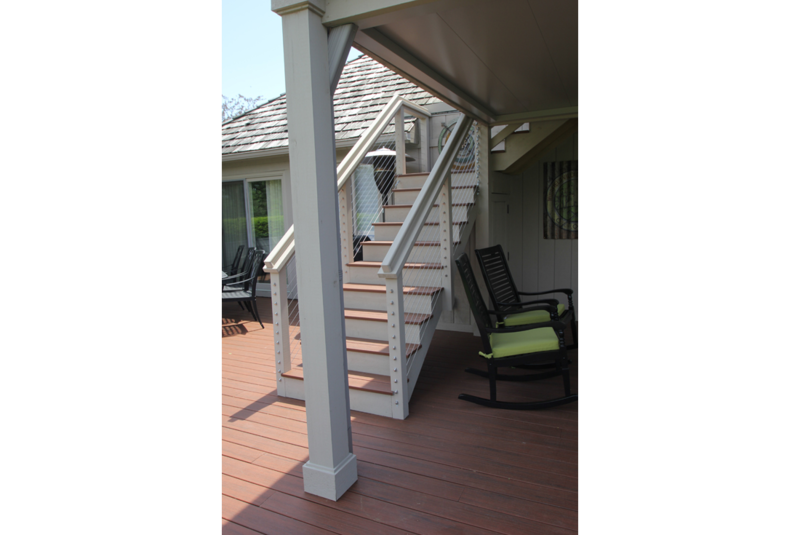 Contact me to schedule an initial consultation on your custom two level deck project.